A big thanks to our new sponsor XS Energy! When you want premium energy with explosive taste, grab an XS Energy Drink! Our Race Director and a contingent of BMST volunteers will be onsite the weekend of August 8th and 9th to evaluate course locations. As we look forward to another exciting year of the Bonneville Motorcycle Speed Trials, AMA Land Speed Grand Championship, we are encouraged by recent reports but we need to be on location with “Top People” to determine exactly what is available for the best motorcycle land speed racing courses. Yes! And.. not all of the areas we race were impacted. A report from a recent fly-over by a friend of BMST indicated that the area affected is looking more “salt-flats” and less “mud-flats.” That info, and the recent reports from the salt, indicate that conditions are improving and that we have a few potential course locations. What do you mean by course locations? Every racing group has a slightly different race setup and course location. We have unique needs that are different from SCTA and USFRA. Every year, we evaluate salt conditions with an excellent team of volunteers that, collectively, have decades of experience on the salt. Thanks to this experience Rex, Mel, Bob and Brad were able to develop the two courses on an island in the lake last year. This year, there is less water but other obstacles to deal with. We will be looking at the available salt and determining the optimal course setup the weekend of August 9-10. Keep wrenching and getting ready to go. We are getting ready, and we are looking forward to starting the AMA Land Speed Grand Championship with you. Whenever we have news to report, we will send it out via our official channels: bonnevillespeedtrials.com, this mailing list, Facebook, and Twitter. Will work for food?.. Volunteer for BMST 2015! Feel like being a part of the action? 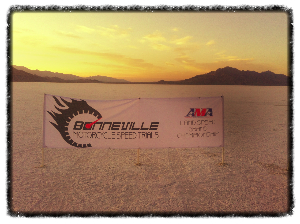 Join a great team of volunteers for Bonneville Motorcycle Speed Trials 2015 and help rewrite the history books. Option 1: Learn more about volunteering. Option 2: Sign Me Up! Bonneville Motorcycle Speed Trials: New Name! New Owner! Bonneville Motorcycle Speed Trials, The AMA Land Speed Grand Championship, is the premier motorcycle land speed racing event. Although this is the first year for this event, it is building from a tradition of excellence set by Denis Manning and the BUB Motorcycle Speed Trials. After nearly 40 years of operating a performance motorcycle exhaust company and 10 years of operating the BUB Motorcycle Speed Trials, Denis Manning has decided to move on to new pursuits. Some would call this retirement but Denis will likely be calling it more time for working on bikes. We salute Denis for giving us all a chance to pursue our dreams of world and national records and are happy to announce a new event and an owner familiar to many participants. Delvene Manning, Owner, Deliciate Promotions LLC, and Bonneville Motorcycle Speed Trials, is carrying on the tradition of running the premier motorcycle land speed racing event. She has been the behind the scenes manager of BUB events since their inception over 10 years ago. As an event manager, and a fellow salt fever addict, Delvene is looking forward to delivering another action packed week of record breaking motorcycle performance August 23-28 2014 at the Bonneville Motorcycle Speed Trials.